I happen to share my birthday with the philosopher Voltaire so highlighting his book Candide which can be read online here. How Candide was brought up in a magnificent castle and how he was driven thence. In the country of Westphalia, in the castle of the most noble baron of Thunder-ten-tronckh, lived a youth whom nature had endowed with a most sweet disposition. His face was the true index of his mind. He had a solid judgment joined to the most unaffected simplicity; and hence, I presume, he had his name of Candide. The old servants of the house suspected him to have been the son of the baron’s sister, by a very good sort of a gentleman of the neighborhood, whom that young lady refused to marry, because he could produce no more than threescore and eleven quarterings in his arms; the rest of the genealogical tree belonging to the family having been lost through the injuries of time. The baron was one of the most powerful lords in Westphalia; for his castle had not only a gate, but even windows; and his great hall was hung with tapestry. He used to hunt with his mastiffs and spaniels instead of greyhounds; his groom served him for huntsman; and the parson of the parish officiated as his grand almoner. He was called My Lord by all his people, and he never told a story but every one laughed at it. My lady baroness weighed three hundred and fifty pounds, consequently was a person of no small consideration; and then she did the honors of the house with a dignity that commanded universal respect. Her daughter was about seventeen years of age, fresh colored, comely, plump, and desirable. The baron’s son seemed to be a youth in every respect worthy of the father he sprung from. Pangloss, the preceptor, was the oracle of the family, and little Candide listened to his instructions with all the simplicity natural to his age and disposition. Master Pangloss taught the metaphysico-theologo-cosmolo-nigology. He could prove to admiration that there is no effect without a cause; and, that in this best of all possible worlds, the baron’s castle was the most magnificent of all castles, and my lady the best of all possible baronesses. It is demonstrable, said he, that things cannot be otherwise than as they are; for as all things have been created for some end, they must necessarily be created for the best end. Observe, for instance, the nose is formed for spectacles, therefore we wear spectacles. The legs are visibly designed for stockings, accordingly we wear stockings. Stones were made to be hewn, and to construct castles, therefore My Lord has a magnificent castle; for the greatest baron in the province ought to be the best lodged. Swine were intended to be eaten, therefore we eat pork all the year round: and they, who assert that everything is right, do not express themselves correctly; they should say that everything is best. Candide listened attentively, and believed implicitly; for he thought Miss Cunegund excessively handsome, though he never had the courage to tell her so. He concluded that next to the happiness of being baron of Thunder-ten-tronckh, the next was that of being Miss Cunegund, the next that of seeing her every day, and the last that of hearing the doctrine of Master Pangloss, the greatest philosopher of the whole province, and consequently of the whole world. One day when Miss Cunegund went to take a walk in a little neighboring wood which was called a park, she saw, through the bushes, the sage Doctor Pangloss giving a lecture in experimental philosophy to her mother’s chambermaid, a little brown wench, very pretty, and very tractable. As Miss Cunegund had a great disposition for the sciences, she observed with the utmost attention the experiments, which were repeated before her eyes; she perfectly well understood the force of the doctor’s reasoning upon causes and effects. She retired greatly flurried, quite pensive and filled with the desire of knowledge, imagining that she might be a sufficing reason for young Candide, and he for her. On her way back she happened to meet the young man; she blushed, he blushed also; she wished him a good morning in a flattering tone, he returned the salute without knowing what he said. The next day, as they were rising from dinner, Cunegund and Candide slipped behind the screen. The miss dropped her handkerchief, the young man picked it up. She innocently took hold of his hand, and he as innocently kissed hers with a warmth, a sensibility, a grace — all very particular; their lips met; their eyes sparkled; their knees trembled; their hands strayed. The baron chanced to come by; he beheld the cause and effect, and, without hesitation, saluted Candide with some notable kicks on the breech, and drove him out of doors. The lovely Miss Cunegund fainted away, and, as soon as she came to herself, the baroness boxed her ears. Thus a general consternation was spread over this most magnificent and most agreeable of all possible castles. Happy birthday! 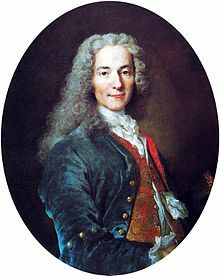 (I looked up the date for Voltaire's birthday, so I know I am a bit early; maybe I should say Happy birthday week!). Thanks for doing this Read 52 thing. It has been a wonderful influence in my life and I so appreciate your existence as a result. So have a great week! I listened to this on an audiobook, and it was excellent. Very good narrator that made Candide very fun to listen to. What a great idea which I never thought of. Off to check it out.